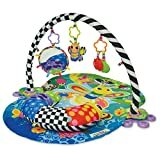 BeBe Style 4 in 1 Animal World Playmat Large. Taf Toys Four Seasons Mat. Lamaze Spin & Explore Garden Gym Olivia the Owl. BBGG Luna Gym Transformer Blue. Taf Toys Seaside Pals Baby Gym. Peppa Pig for Baby Tummy Time Activity Mat. 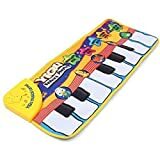 Fisherprice Kick 'n' Play Piano Gym. Bright Stars Splashin' Safari Prop Mat.